In press, available in Chemistry – A European Journal. 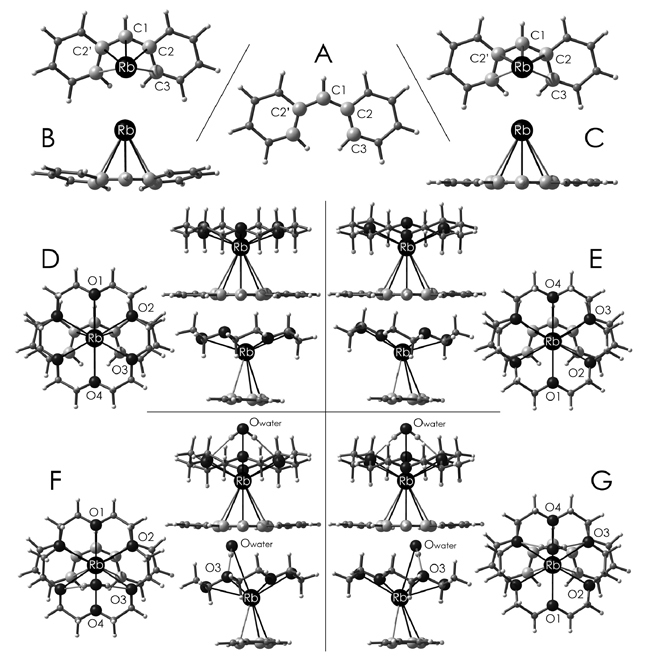 The theoretical work is a continuation of alkali metal coordination studies first reported in paper #3, (Alexander, Allis, Hudson, and Ruhlandt-Senge, An examination of metal-ligand binding modes in rubidium diphenylmethanide J. Am. Chem. Soc. 2003, 125(49), 15002-15003) and featured in a chapter of my thesis. The density functional theory study is still, unfortunately, a transitional piece in the progress towards solid-state DFT calculations for understanding solid-state interactions. In the JACS article, the computational cost of predicting binding energies was considerable beyond feasibility for the two crown-Rb-diphenylmethanide structures (it was performed in 2002, after all), leading to single-point energy calculations of the crystal geometries to generate first estimates. This paper extends the calculational work considerably with the geometry optimization of all of the component systems but still, due to the sizes of these unit cells, does not directly address crystal interactions via solid-state calculations. Alternatively, the purpose of the calculations was to determine the range of the binding energy of the diphenylmethanide as a function of Rb+ solvation, thereby providing an estimate of the minimum crystal cell forces that must occur to yield the two different crystal forms for this coordination complex. With this relative energy study comes a discussion of the role of cation solvation and how either strained geometries lead to the introduction of new binding sites or the availability of other ligands in solution can influence the final binding mode of the considered ligand (an organic chemist would think of Rb+/18-crown-6 solvation, the encapsulation chemist would think of the Rb-diphenylmethanide binding, the Rb+ chemist would wonder what all the shrubbery’s about). This paper also is the first to feature my use of NanoEngineer-1 for structure/view manipulation and graphics generation (in this case, with POVRay). Also, as is increasingly becoming the case, the distinct separation between theory and experiment in the same publication is noted by my inclusion as a corresponding author. I suspect that continued interdisciplinaritization (we only obtain new words in the lexicon when people make’em up) of acedamic research is going to eventually require that journals also point out who-did-what, if for no other reason than to make sure that the entire crew in the author list doesn’t go down with the good ship U.S.S. Irreproducible Results. Abstract: In search of new synthetic precursors for the preparation of alkaline earth organometallics, we investigated the application of a powerful desilylation reaction to cleanly afford a variety of contact and charge-separated alkali metal derivatives without the difficulties commonly encountered in other methods. The resulting diphenylmethanides display both contact molecules and separated ion pairs. Analysis of the structural data demonstrates that simple electrostatic models are insufficient for predicting and explaining the solid-state structures of these complexes. Detailed computational investigations were performed to probe the nature of the metal-anion and metal-donor interactions and determine the contributions of each to the observed solid-state structures.